After hesitating for a number of years, a hesitation which was caused by definitely mixed reviews on the internet, I have finally taken the plunge and bought the box set of this series on spec , having never seen a single episode of it. Not a favourite of the cult TV world, is I suppose the verdict on the internet. This verdict seems to be based on the idea for this show cannot decide what it really wants to be. It is either an actual spy series set in the Edwardian era, or it is a light piece of fluffy parody, off the sort which the 1960s did so well. The show has been compared to Adam Adamant, just with the proviso that in this there is the hero has never gone to sleep. It has also been described as an Edwardian Avengers, surely a huge compliment if it can be said to be true. I have been trying to get out of the habit of making general posts about a new series, and instead concentrating on posts about single episodes, but I am watching this series for the first time, really with only half an eye, and want to reflect on its impressions on me. For a start there is a slight problem with the title. Word Virgin meant what it did now in 1968, and pretty well has meant the same thing since the dawn of time. Yes it is true that there are difficult surnames around, we only have to look at the situation in Strange Report, where Strange has a habit of walking into a room and saying, 'hello I'm Strange,' and I can only repeat that in reality you would not say that you would say that your name was strange. It is inconceivable to me that anyone has ever had a Virgin as a surname. Naturally I am quite prepared to be proved wrong about this, you were saddled with that burden of a surname you would probably take great care to change it very quickly. So therefore has an absolutely ridiculous name as part of its title, which implies that it is pure comedy and parody. I do see why some people say that and decide whether it is comedy or a straight spy series. Moments in the episodes I have watched have made me laugh out loud. There have also been moments when Virgin has definitely compared with Adam Adamant in stuffiness. This show has the advantage that this stuffiness and formality are seen in their natural context rather than in the anachronistic setting of the 1960s. However to appreciate the show I think it is very important to remember that it was made in 1968, so that while not set in the 1960s it is a product of it and must be seen against the backdrop of the time. This is the age which gave birth to the other TV programmes that I have mentioned in this post, and both they and Virgin actually draw heavily on the cultural milieu of the time. When I think of the setting of most of the TV series I write about here, I say a mixture of periods been drawn on. What I mean by that is that while I often find myself talking about the futuristic technological aspirations of the 1960s, when I look at the visual setting of these aspirations, I often see a yearning for the past. In the Avengers this comes across as a yearning for a Britain which probably never really existed, and which the series is very careful to with the actual contemporary world of the 1960s. We also see the artefacts of the past used in a modern setting in the series: I am particularly thinking of John Steed cars for example, which would already have been too old to be reliable run around in the 1960s. In the fashions of the time we see young people queuing up at shops in Carnaby Street and elsewhere to buy old military uniforms as fashion. Virgin provides the setting where those military uniforms which that young people were wearing, were actually warm as real uniforms. It also provides a heavily colonial setting for the series, which moves from place to place in the days when most of the map of the world was Pink, representing the British Empire. I wonder whether virgin represents an insecurity of the time, since it was at this time that the Break-Up of the British Empire was gathering speed, and at the same time the Citizens of our former colonies were establishing themselves in Britain. That said I doubt very much that this was at the forefront of the shows creators mind. 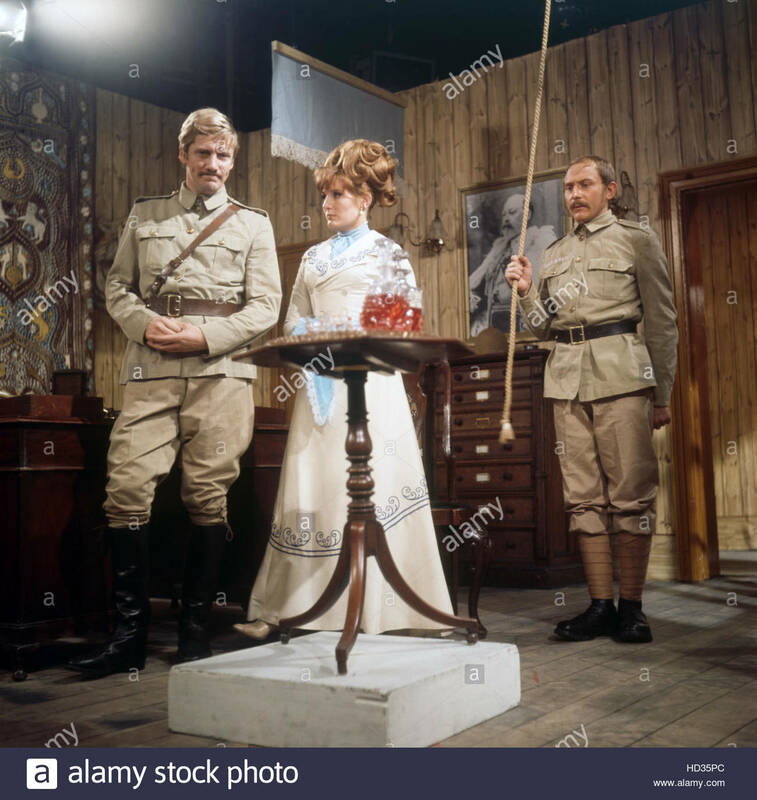 That said, writing this post has made me wonder whether a yearning for Empire was also partly the inspiration of the latest series of The Avengers, since the English settings of I'll definitely what I would call avenger land. I imagine that this show was originally broadcast in colour, but the episodes on the DVDs are in black and white. As no this is not an unusual situation with shows of this era. In this case I regret it because I have a feeling that if we could see these shows in the original colour we would see that the sets are very much like those used in the Avengers episode Pandora: This show is of course set in the same period as Pandora was, and looks and feels like it. The photo I am using to illustrate this post is one of the many photos of the sets (the show is almost completely studio based, unusually for this late in the 1960s) and shows one which looks virtually exactly like John steed's flat in series 6! This show avoids one of my own personal bugbears, have repeated use of actors who tends to make me at least think about where else I have seen them rather than the show itself. The star is an actor who I am ashamed to say I had never heard of before, Clinton Greyn. I certainly should have heard of him, because he managed to guest star in pretty much every one of the shows I have in my collection. He also did extensive film work, and has also worked as an architect been presidents of the 20th century Society. My own verdict on this show is that if you like the sort of programs I write about here, you should give it a go. It works better as the sort of escapist TV I like, van as either a straight spy show or a comedy. I think to viewers of my sort of television it would provide another example of the sort of odd series made in the 1960s, I would be very interested to hear readers opinions of this show, since Internet reviews seem to be so divided.